Over $120 million in sales of NYC condos, co-ops, townhouses and commercial properties. We first met John in 2011 when we were looking for a 1 bedroom apartment on the UES. At the time he seemed to be just starting out as he was working with a more senior broker. We were struck by how respectful, amiable, and hardworking he was though, so when it was time to upgrade to a 2-bedroom in 2017 we knew who to call. By then John was in charge of his own team. We were pleased however to find his steadiness, honesty, reliability, and hardworking ethic unchanged. His confidence and enthusiasm for the business has only increased with time. We value and trust his opinion, and after only one open house we had multiple competing offers and were able to sell above our listing price and go on to purchase our 2-bedroom. Throughout the process John was very responsive, and adapted quickly and with good judgment when snags and unexpected issues arose. We have referred our friends to his team and will continue to do so with no reservations. -Emily W. and Dirk V.
John and The Ameralis Team went above and beyond yet again for me and my partners. They not only helped us on the buy-side and lock in a great development site, but they also helped us from floorplan designing, unit mix, finishes and the end result aesthetic. We were so pleased with their work, we also hired them to represent us on the sell-side and we were able to get over 8% more from originally underwriting. Aside from being the consummate professional, John takes the best interest of his clients to another level. He does not stop working when the work day is done. John consistently puts his best efforts forward. Unlike your ordinary broker, John treats every deal like a personal mission. He is on the full journey with you from beginning to end. We would recommend John and his Team to any developer in New York City. They have a keen understanding of the market trends and from the very beginning we felt like we were engaging with a powerhouse real estate broker. John's honest, direct, no-nonsense approach helped us to sell our brownstone development at 97.5% of the original listing price, and we couldn't be more thrilled! We would even recommend John and his Team to our family and friends. As a developer, it is imperative to move smart and quick, and John immediately brought in a number of talented outside service providers that had a great combination of being highly skilled, reasonably priced, and experienced working as a team with John. These included photographers, floorplan drawers, copyrighters, PR company, attorneys, expeditors, architects and staging companies. Clearly John is ready to take on sales that have specific needs and bring on the right people needed to get the best possible result for the client. John and his Team members showed us that they can execute their Marketing and Branding Strategy in motion instead of just wooing us in a pitch presentation. They showed the property to over 70 prospective buyers in the first two weeks we had it listed on the market. By the fifth week, we had two offers and went with the most qualified and highest offer. We could not be any more pleased and we consider John as Family. We are currently working on our next development projects! - Thomas D.
John was a lifesaver in the sale of my apartment on the Upper East Side. I had bought the unit three years earlier with him acting as the seller’s broker at the time, so when I needed it sold FAST, I knew I had to give him a call. From that first phone call to the close date, the process was incredibly efficient, seamless, and as stress-free as selling an apartment in NYC can be. Even though I already had high expectations going into working with John given his experience with the building, I was still impressed by how quickly he was able to set up photos, get the apartment listed, and get in buyers. I especially appreciated his responsiveness and him keeping me in the loop on the progress of open houses and applications. His ability to stay organized and keep me organized helped relieve any anxiety I would have had and allowed me to put my trust in him as someone “on my team”. If I could, I would have John sell any and all homes I ever live in. - Elena W.
A driven and motivated professional with a distinguished track record of success, John brings a tremendous sense of enthusiasm, dedication and diligence to every client-and to every single real estate transaction. Whether representing developers, sellers, buyers or landlords, John works tirelessly to ensure their needs are met and exceeded. 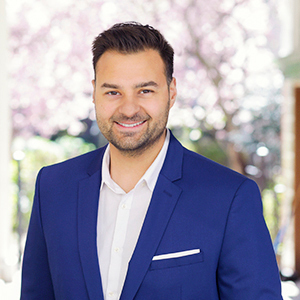 John began selling real estate at the age of 20, and since then he has become known as an industry leader who brings a sense of positivity and confidence to every deal. John is intimately familiar with neighborhoods and property inventory throughout New York City. He constantly stays in tune with market dynamics and trends in order to offer his clients exceptional and timely advice. Originally from Northern North New Jersey, John holds a degree in Finance from Montclair State University. His strong background in finance, sales and marketing is enhanced by his sharp attention to detail and unmatched commitment to success. A happy resident of brownstone Brooklyn, he is enamored with his neighborhood's friendly ambiance and proximity to Manhattan, McCarren Park, and some of the finest eateries and cafés in the city. Outside of his busy workdays, John likes to exercise, read, sail, play tennis and ski.